1. It’s a generously sunny and comfortably warm late summer day. You sit inside (because there is no outdoor seating), and watch passersby. That’s okay, it’s quieter inside anyways even with the screaming infant. You try to take a moment of relaxation and let it linger with your last few sips of wine (9 bucks a glass, but you need it). Then someone shoves a check onto your table. Should you stay, or should you go? 2. It’s a generously sunny and comfortably warm late summer day. You sit outside because terraces are everywhere. Everyone is relaxing and enjoying their food. While some have already finished, they continue chatting and seem in no hurry. Children are happily playing in the plaza. You sip your wine (beverage included in your 11 euro lunch) and no one shoves a check in your face (unless you ask). Should you stay or should you go? Number one is a typical American city lunch experience, while number two maybe happens on vacation. Most Americans can’t imagine the second scenario being the norm, anywhere. Unless of course, they’ve been to Spain. The terrazas never stop – even when the colder weather sets in. Ultimately, we had a similar choice: move back to New York City, or keep living here. Our original reasons for moving to Madrid a year ago are still quite relevant, but we now have a resident’s perspective. So here’s why we’re staying. We each spend about 30% of our income on rent and we make less money than we did in New York City. While people do complain that Madrid has gotten more expensive (what city hasn’t? ), it’s super cheap compared to one of the most expensive cities in the world and even to most other Western European capitals. We can eat out, go out, attend cultural events, and take day and weekend trips with a frequency we couldn’t afford in New York City. This reappropriated slaughterhouse is now a cultural space for free art exhibitions. Are we harping on New York City too much? Point out an American city that has free admission times or days for almost every museum, where there are bargain movie days under 5 bucks, where we can eat out at a sit-down restaurant couple times a week for 10 bucks a piece, and not need a car to do it all. We’ll accept submissions at [email protected] (Yes, New York has some of these things, but expect any free event to be incredibly crowded and take an hour to get to from wherever you can afford to live). Speaking of transportation, Madrid’s public transit is cheap too. In Zone A (city center and beyond), metro and buses are € 1.50-2 and commuter rails are 1.70, but monthly passes can cut these prices to a third per ride (assuming you ride twice on weekdays). If you’re under 26, you can buy a monthly unlimited pass for €20 that will take you all the way out to Zone E – that’s literally in another region of Spain. Just a quick day trip via public transport to a CASTLE in the mountains – still in the Madrid region! With a monthly metro pass, you can get yearly bike pass for € 15 (even without the pass it’s a cheap €25/year). This means you can ride the bikes at 1 euro an hour. Plus, the bikes are electrically assisted for the massive hill that is Madrid. It doesn’t even make sense economically to own a bike when you consider the upfront purchase, upkeep and repair, and potential to be stolen. In New York City it made sense for me to own a beater bike, but not here in Madrid. Last but not least, affordable health insurance! Basic plans start at 12 euros a month, and premium at 40 a month. Tack on another zero onto those and you’ll have health insurance in the U.S. – and you won’t get as good coverage. If you think this affordability means lower quality, guess again. Fresh squeezed orange juice is available everywhere in Spain. My friend exclaimed it was the best orange juice he’s ever had – and this guy is an orange juice connoisseur. I had just cold pressed a bottle from the self-service machine in a supermarket for 2.80 euros per liter. Even every bar has a fresh orange juice machine and you can get a good sized glass for a euro. Again, this would cost probably five times the price in NYC and at least 3x the price anywhere else in the U.S. Unlike the US, most produce is domestically grown is in Spain. And unlike the US, it actually tastes good. Fresh baked bread is on every corner. And for some Spaniards, this bread is still subpar, preferring smaller, more traditional spots from their home village. This 50 cent loaf of fresh baked bread would be “fancy” back in NYC and at least 5 bucks. Restaurants, possibly due to their much shorter kitchen intervals, serve super fresh and great tasting food. With having to keep less food on hand, and working with dramatically smaller menus, including el menú del día, it makes sense why the food costs less and is fresher. If you haven’t noticed, we like to travel (Sam more than Veren). We also loathe to own a car. So good, affordable intercity public transportation is a must, at a minimum. Have fun driving through city center streets. Not only does Madrid boast an excellent metro, bus, and commuter rail, there are the aforementioned BiciMad bikes, and the city is very walkable. Then throw on the affordable coach buses and trains going nonstop to other major cities and communities. Madrid is right smack dab in the center of Spain. Madrid’s expanded international airport has budget flights on which we can travel just about anywhere for cheaper than within or from the US. It’s very typical for a Brit to spend a weekend in Spain, as we’ve met countless people doing. Can you blame them when budget airlines offer 20 euro one way trips? In the US, it was quite difficult to house sit full time without massive gaps as beginner house sitters. We also didn’t own a car and the majority of house sits in the U.S. require the house sitter to already own a car (though we were offered use of homeowners’ cars on several occasions). This past summer in Europe we traveled over two months in four countries via house sits, less than 10 days of which paying for accommodations to fill the gaps. House sitting is an amazing way to travel cheap, and we’ve made some great friends along the way. Sometimes they’re pet owners, other times it’s people we’ve connected with through social media who are doing the same things we’re doing. Being able to meet new people and make time for others is very important to us, which leads to our next point. People make time to see friends, even when they’re busy. The Spanish put a priority on leisure time, which could just be called social time. Time outside the home is meant to be with family and friends. The never-ending amount of bars, restaurants, and plazas around every block attests to this. And because this lifestyle is such a priority, affordability comes right with it, as we mentioned before. We see our friends way more frequently in Madrid than we did in New York, when social engagements had to be planned out months in advance because everyone was so busy. We know engineers, artists, political activists, academics, maybe even some secret billionaires. Either way, if they’re in town, we get to see them. We still see them even if they’re living in another country – it’s that cheap to come back and visit. And every time we meet, you better believe it’s to eat. This may seem redundant, but it’s worth elaborating. We love to eat, if you haven’t noticed yet – it’s at least one-third to one-half of our blog (check out our vegan city guides here). Spaniards do too, and for them, it’s a social affair. Other than an apple or pastry on the way to work in the morning, they find it abhorrent that people eat meals in front of a computer. Nine to Fivers can easily end up lunching out every day. Most people eat out at least twice a week, with many going out a few times a week. Homemade burger with starter and wine? Dessert to follow. Of course in the vegan scene, you’ll hear naysayers proclaim the prohibitive vegan pricing. Like any city, it has less to do with it being vegan and more about scouring the city for the best deals. We love eating out in Madrid so much we wrote several articles about it. Eating lunch out is its own thing, as much as going out for the more internationally famous tapas. The vegan food scene is exploding here – check out our comprehensive vegan guide to Madrid. Anyone who knows me can’t imagine me not speaking – so imagine landing in a new country and culture and me not being able to express myself. I wouldn’t tolerate this for long. And what better way to learn a language than immersion? We just met a French student last night who loved that most people here don’t speak English – great if you want to learn. Living in Madrid allows us to keep doing our thing with much lower financial pressure. Having less overhead means we can work less, and spend more time on our personal projects, without giving up our social lives. Which in turn, increases our overall quality of life. It feels really good to live here. Travel is a privilege bestowed upon us, especially as Americans. So why not take advantage of these benefits? Otherwise would be a shameful waste. Have you ever lived in another country, or would you like to? Tell us your story in the comments! 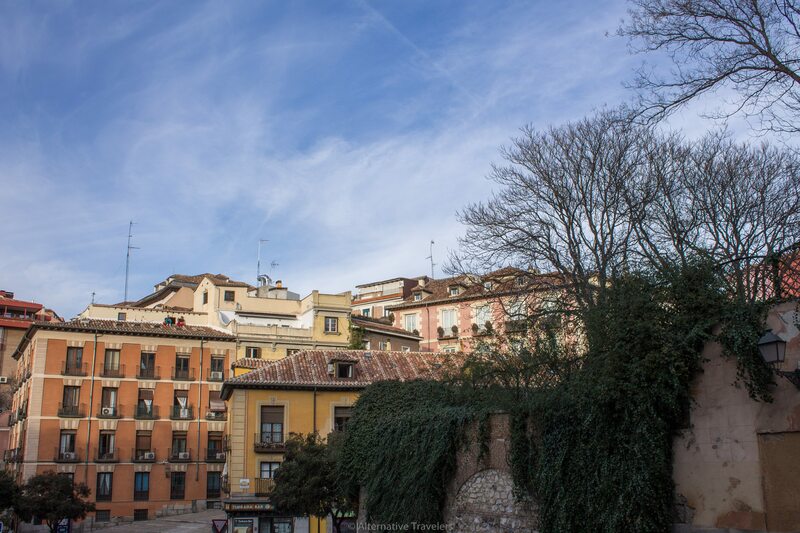 Pin Our Expat Story: Why We’re Staying in Madrid!